The following article presents a subjective perspective on the history and evolution of the Planar-type lenses from their origins to modern times. 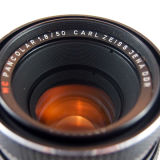 Only general-purpose (non-macro) Carl Zeiss Planar standard lenses (focal length comprised between 40mm and 60mm) are discussed. Because the 50mm focal length has been the most popular and the most investigated for decades, the history of Planar-type lenses is a loupe-view into the history of the German 35mm photography industry and into the evolution of the global photographic market. This article was originally written in Italian in 2008 by Marco Cavina and can be found here. With great pleasure we present this freely translated English version, revised and extended as of early 2015 by Alberto Oddo. Some of the images below are supplied by Hans-Jürgen Kuc and were originally printed in his excellent Carl Zeiss Contaflex, Contarex and Contarex books. The symmetrical double-Gauss design was known long before its potential could be fully exploited. Dr. Paul Rudolph, one of the mathematicians working at Zeiss, applied this principle to the calculation of the first Planar in 1896. The name derives from its low astigmatism and high field flatness. an extract from the original patent by Dr. Rudolf from 1897. Note the Flint-Crown achromatic doublet in the middle groups. With the technology of the time it was impossible to effectively correct coma and prevent loss of contrast, so the Planar design was set aside until after WW2. Those were the days of glory for Tessar- and Sonnar-type lenses, which were already capable (especially the Sonnar) of better contrast and undetectable coma. While Leitz had their first try already before the war with the 50mm f/2 Summar, Zeiss relied on their Tessar and Sonnar designs until the availability of lens coatings and modern lanthanum-enriched glass created the conditions to fully exploit the double Gauss potential. Truth be told, the Planar scheme wasn’t totally forgotten for that long. During the 30’s Zeiss introduced some Biotar and Mikrotar models based on a double-Gauss design. These were however specialist macro lenses for high magnification photography, and represented a negligibly small niche. In the early 50’s Zeiss could count on the two great mathematicians Johannes Berger and Günther Lange, who shortly preceded the arrival of the famous Erhard Glatzel. Berger and Lange systematically studied the Planar formula and its variables and soon they were able to design several lenses for medium- and large-format cameras, which were later very highly regarded – e.g. the Planar 3.5/75 and 2.8/80 for Rolleiflex, the Planar 2.8/80 for Hasselblad, and several models for Linhof. At that point it was clear that Planar-type lenses could offer better and more consistent corner-to-corner performance than Sonnar, Tessar and Ernostar designs, and Zeiss invested considerable resources in their development. Curiously though, the wide range of Zeiss 35mm cameras was still being fitted with Tessar and Sonnar lenses. Already in 1953 Berger and Lange had calculated a fast-aperture Planar for 35mm cameras, but its launch was being delayed. 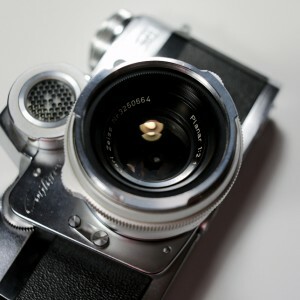 The first Planar for small format cameras to enter production was the famous and most highly regarded 50mm f/2 equipping the Contarex I “Cyclope” in the late 50’s. 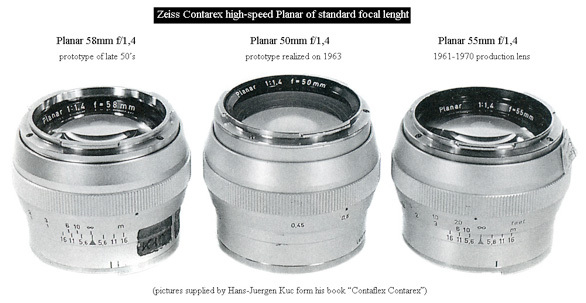 However, Zeiss managers initially wanted the first Planar to equip their Contaflex cameras. 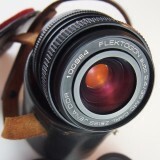 This fixed-lens SLR system was mature and refined, quite popular and very well regarded. 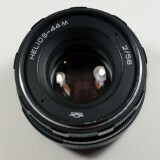 Its excellent Tessar 2.8/50 lens was capable of brilliant optical performance. 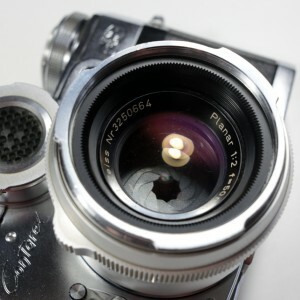 The front lens could be removed and replaced with optional add-ons called “Pro-Tessar”, which provided access to a limited set of focal lengths and partly compensated the shortcomings of a fixed-lens system. The Contaflex range was very important for Zeiss: its simple construction allowed to contain the price without giving up on quality. Moreover, Zeiss was a major stakeholder of Deckel Munich, the company that manufactured the shutters equipping Contaflex cameras. 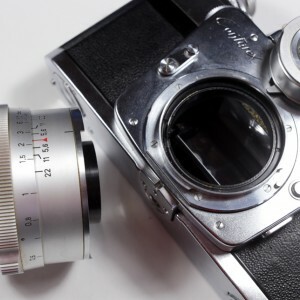 Contaflex cameras had enjoyed a good commercial success, but in the late 50’s competitors started introducing faster lenses that appealed customers more and more. To face this challenge, Zeiss entrusted Berger and Lange with the calculations for a Planar 50mm f/2 with 6 lenses in 4 groups based on the symmetrical double-Gauss principle. 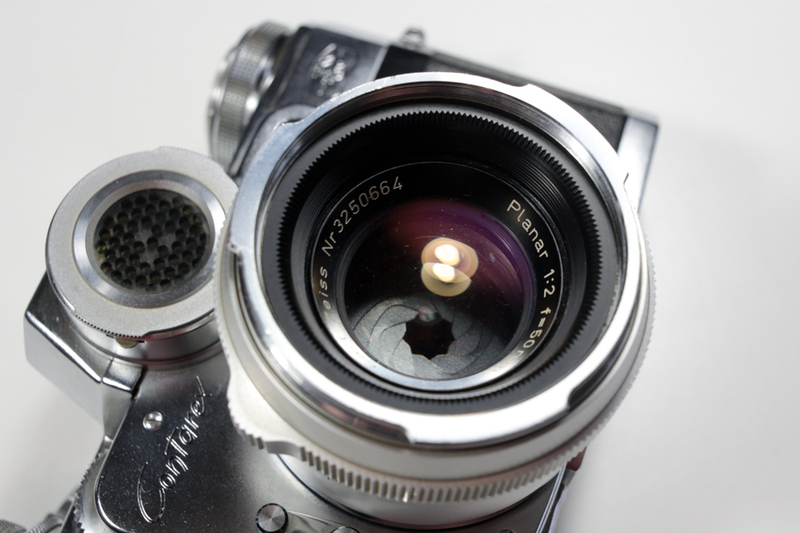 Additionally, as for the Tessar, such lens had to be encased in a barrel that allowed the front module to be disassembled and replaced with the optional add-ons – also to be calculated for. The Planar add-ons turned the 50mm f/2 into either a 35mm or 85mm, both f/4. 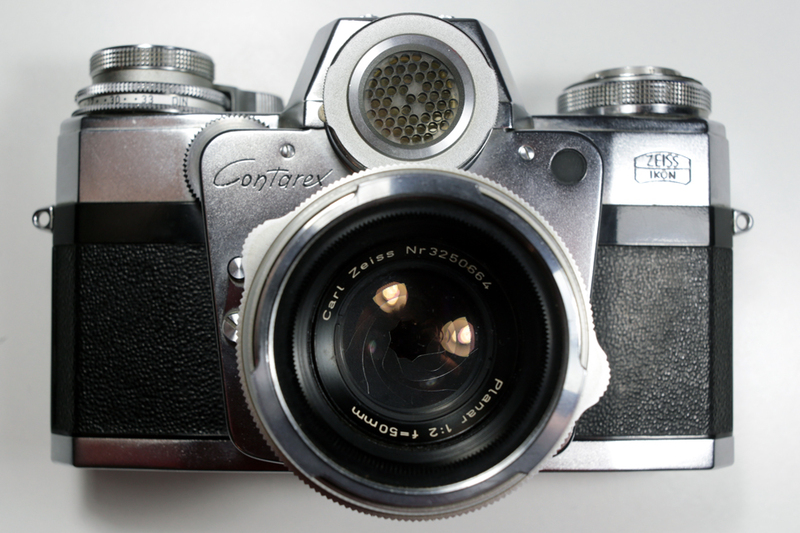 The original Contaflex Tessar 2.8/50 allowed only the front element to be removed: the Pro-Tessar add-ons thus had to be mounted on an already well defined, fixed optical core. With the new Planar, the whole group in front of the diaphragm could be removed, leaving only a dispersive (Flint) rear group with easily adaptable characteristics. Berger completed the calculations for the Satz-Planar 2/50 in October 1956, while the add-ons were ready in 1957. Berger himself calculated the Satz-Planar-Gon 35mm f/4 wideangle add-on in June, while Lange provided the plans for a Satz-Planar-Tel 85mm f/4 in September. For each add-on, two slightly different versions were calculated. a rare image of the Satz-Planar 2/50 prototype together with its add-ons. Besides the adoption of lanthanum-containing glass, attention should be paid to the basic Planar design and the characteristics of each glass element. Meanwhile, the Contarex project was almost ready for launch. This new system was targeted at a much higher market segment than the Contaflex, while also being fitted with a Planar 2/50. Zeiss executives, probably fearing that an upgraded Contaflex could jeopardize the ambitions of the new and sophisticated Contarex, reconsidered their original plans at the last minute and cancelled the Planar upgrade. The image above displays the Satz-Planar prototypes, testifying how close they were to full-scale production. 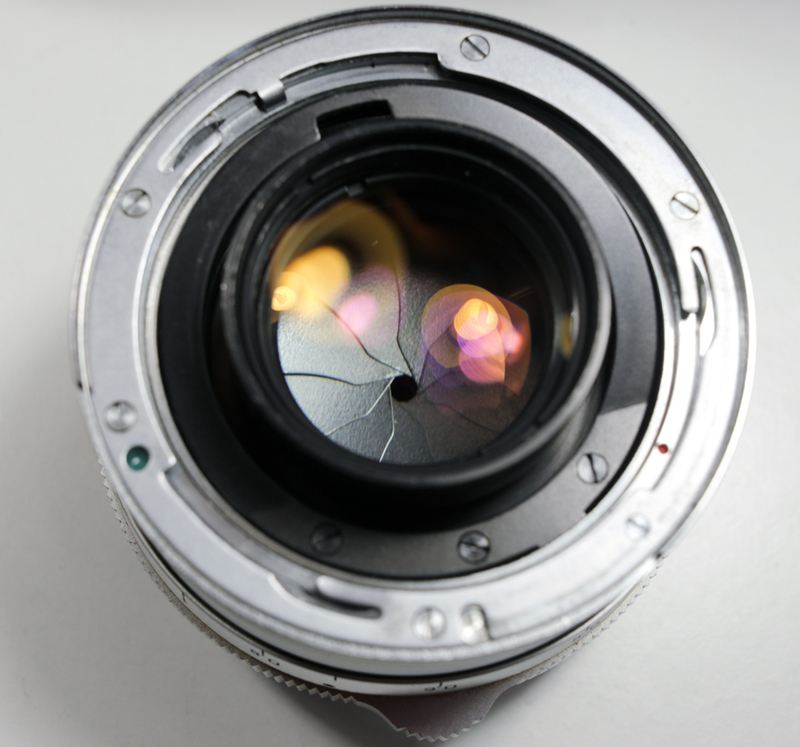 The Satz-Planar 50mm f/2 was the first assembled Planar for 35mm cameras and reveals Zeiss’ commitment to the Contaflex system, which had represented a constant and significant source of revenues. Indeed, when competitors threatened the system competitivity by offering faster lenses, Zeiss had their top lens designers deal with a response. 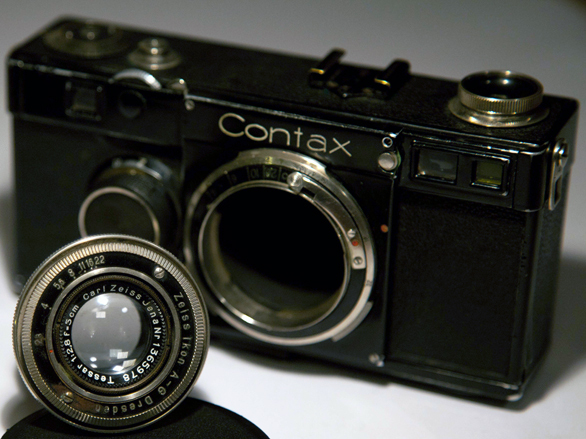 Interestingly, Contarex cameras were not equipped with the Satz-Planar from 1956, but with an earlier version calculated by Berger and Lange in 1953. The 1953 Planar has no flat cemented surfaces whereas these are present in the front doublet of the 1956 model – also featuring almost flat R13 and R15 surfaces. Flat surfaces are more easily manufactured and help containing production costs, definitely an issue for a middle-range system like the Contaflex. The coexistence of the Contaflex and Contarex systems, both 35mm, tortured Zeiss managers and led to many initial decisions and almost as many counterdecisions. Not many know that the first Cyclope prototype designed by Sauer was pretty much identical to the actual production model but still sported the old Contaflex branding rather than the roaring Contarex one. It seems like Zeiss managers were considering the option of taking the Contaflex line, with all of its customer base and notoriety, and upgrading it to the high-end system that the Contarex was being designed to be. Looking back, it might have been a more fortunate choice. These years of marketing and development indecision would later prove fatal for Zeiss Ikon as a camera manufacturer. 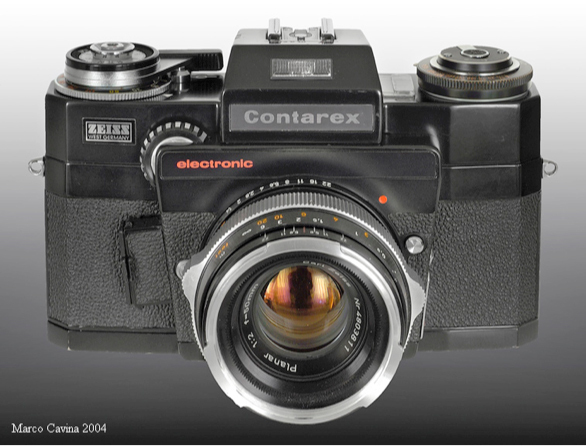 The 50mm f/2 for Contarex was the first Planar for 24x36mm systems reaching production. 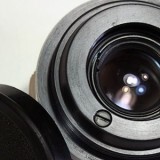 This lens acquired a legendary reputation and many still consider it the overall best standard lens ever made. The first batches, in a silver finish, left the Oberkochen warehouses in 1957. A few very rare totally black Carl Zeiss Planar lenses were made during the same period. 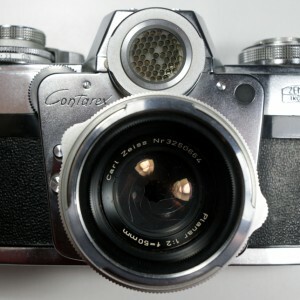 image of a Contarex electronic mounting the Planar 2/50 (version 2 in black finish, also known as B-Planar). It is remarkable that the 1953 project was kept on hold for four years while the newer 1956 version was definitively aborted. The two single elements of the Contarex Planar are made from lanthanum-enriched LAK9 glass, but the overall uncomplicated design and medium maximum aperture didn’t require additional exotic glasses. This contributed to the consistency and robust performance the lens became famous for. 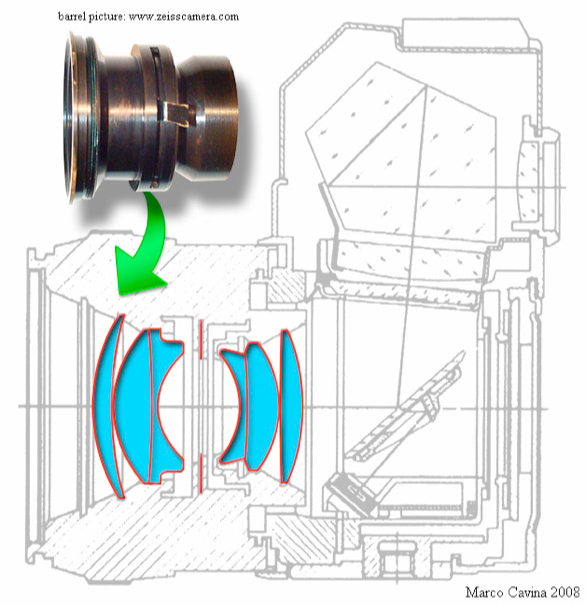 cross-section of a Contarex camera and its Planar lens. The optical core was encased in a barrel made from naval brass and assembled with micrometrical precision. A few years after the Contarex launch, competitors raised the bar again by offering yet faster lenses. They appealed low-speed slide users and represented a sort of flagships that catalyzed the sales of the whole lineup. When Nippon Kogaku launched the Nikon F, a few months after the Contarex I, they offered a 58mm f/1.4 from the very beginning (replaced a couple of years later by a more conventional 1.4/50). Zeiss management board had soon to deal with the possibility that their new Planar 2/50, although excellent, would have looked unattractive next to the competition’s “speed monsters”. 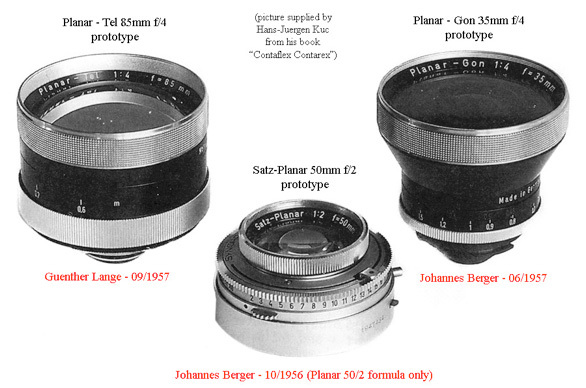 The collaudated Berger-Lange team was immediately entrusted with the calculations for a faster Planar f/1.4 to match the offerings from the competition. Walking the steps of Nippon Kogaku, the duo initially came up with a 58mm f/1.4 (a slightly longer focal length reduced retrofocal clearance problems, simplifying calculations quite a bit). This lens reached the prototype stage but was then put aside in favour of a 55mm f/1.4 version (ready in 1959). On the other hand, the market wasn’t actually expressing any actual criticisms to the Planar’s maximum aperture, probably being more than satisfied with its optical performance and short (30 cm) minimum focusing distance. 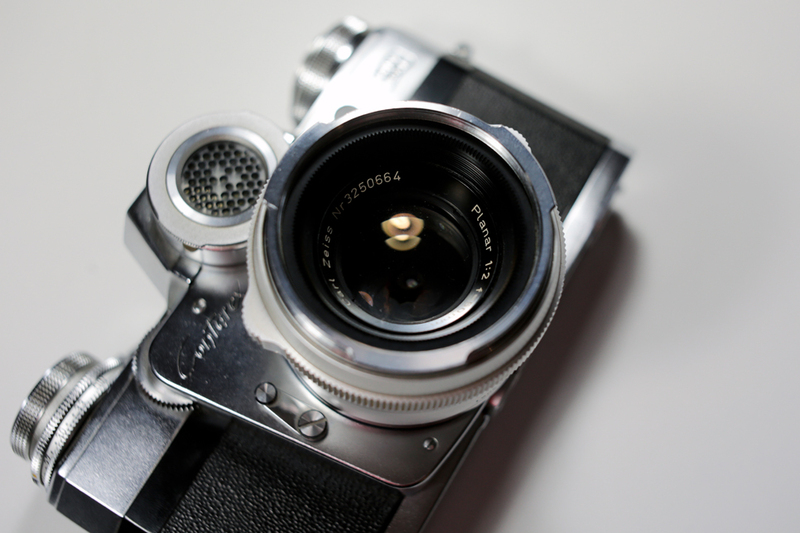 The actual launch of the Planar 1.4/55 was thus delayed until 1961. The Contarex Planar 1.4/55 by Berger and Lange is based on an asymmetrical double-Gauss scheme with 7 elements in 5 groups. 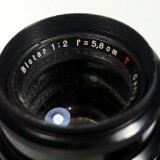 It is similar to the Nikkor-S Auto 50mm f/1.4 from 1961. The front doublet has flat cemented surfaces and its formula includes four high-refraction/low-dispersion, lanthanum-enriched Flint glass elements (two LAF33 and two LAF3), as well as a standard high-refraction/high-dispersion Short-Flint SF6 glass (nD = 1.80518). This lens has a very charming and picturesque rendering wide-open, but at medium apertures it has always been considered inferior to the Planar 2/50. This is a very common behaviour for super fast 50mm lenses from the 60’s when compared to their slower versions. Not everyone knows that, after the initial 1.4/58 prototype and the 1.4/55 production version, around 1963 Zeiss prepared a prototype for a Planar 50mm f/1.4 – as Nikon had done as well. This 1963 prototype had a complex Gauss design with 8 elements. It contains two cemented doublets, one of which constitutes the front element. 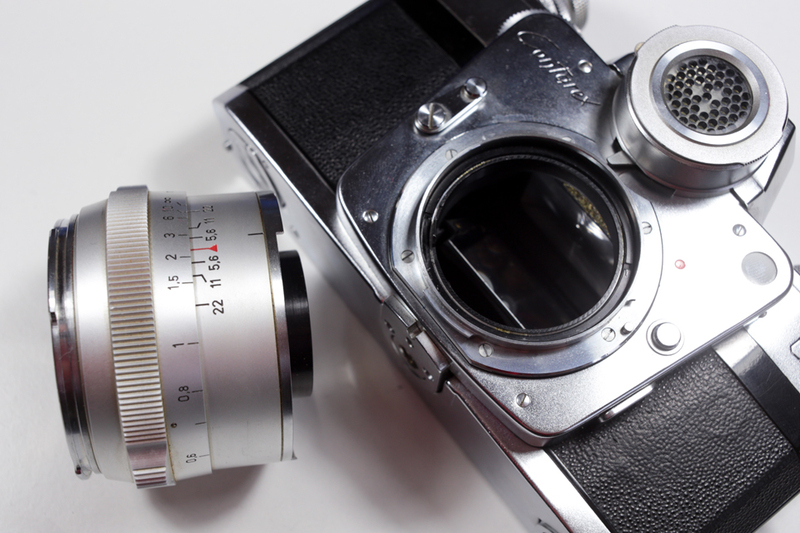 It is substantially different from its successor, the Planar 1.4/50 from the 70’s – which is still in production today with only marginal differences. The 1963 Contarex Planar 1.4/50 is an asymmetrical double-Gauss consisting of 8 elements. 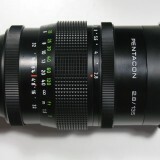 The cemented front-doublet is reminiscent of Leitz Summitar 50mm f/2. Interestingly, its design involves only three kinds of glass, with as many as five lanthanum-enriched Flint glass elements. The two elements closest to the diaphragm are made of Short-Flint SF6 glass and a SF1 element in position 2 completes the scheme. No Crown glass is included! This was certainly a very daring project for the time, and much more advanced than the Planar 1.4/55; on the other hand, it was also probably more difficult and expensive to manufacture. Again, this project reached the prototype stage but never moved on: the Planar 1.4/55 was already being produced in small batches, and Zeiss managers likely didn’t want to bear the costs and risks of setting up another production line to be run only in small numbers. the three Planar f/1.4 calculated for Contarex cameras: to the left, the first 58mm prototype; to the right, the 55mm production model; in the middle, the only existing 50mm prototype based on the scheme by Lange. Following are the schematics from their original patents. It is possible to note the longer optical core and the higher refraction of the front doublet, different from the single lens featured in the other versions. Many thanks to Jürgen Kuc for sharing the picture of these extremetely rare items. Throughout the 60’s, the only standard focal length Planar lenses for 35mm cameras were the 2/50 and the 1.4/55 for Contarex. 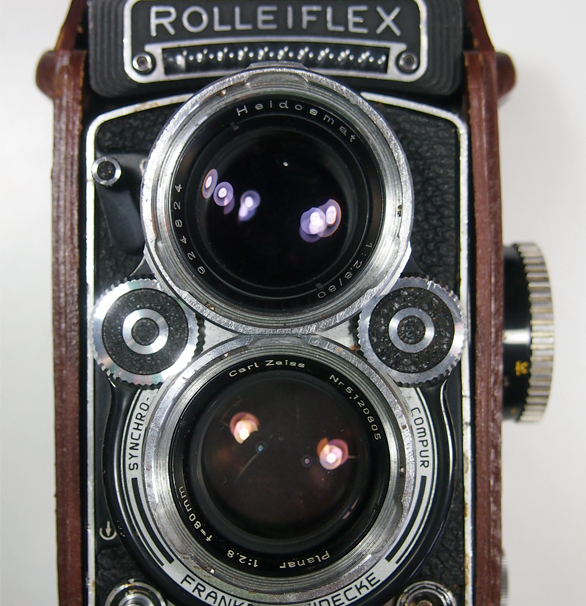 Meanwhile, the long-time commercial partner Franke und Heidecke (Rollei) was planning an entry in the 35mm reflex arena. Zeiss lenses were chosen as prestigious companions to attract users into the new system. 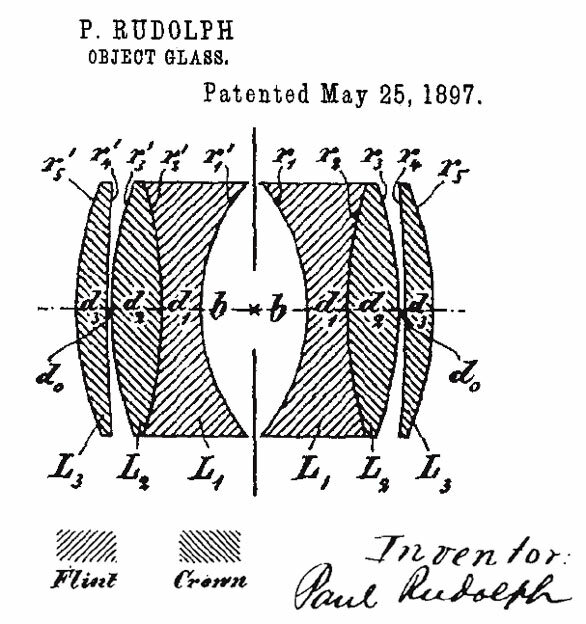 It is interesting to notice that Zeiss didn’t oppose any resistance to this venture, even if in one way or another it was going to compete with the in-house Contarex system; quite on the contrary, Zeiss armed the competition with the same optics or even newly designed versions, at great labour and financial expenses. With their camera division (Ikon Stuttgart) losing more and more money, the current identity of Zeiss was starting to delineate: a third-party lens designer and manufacturer that leaves others to struggle in the way-too-fast-paced camera market.